Contexte : 11 Septembre, environ une heure après l'attaque du Pentagone. "Huge explosion, great ball of fire, smoke started billowing out, and then it was just chaos on the highway as people either tried to move around the traffic and go down either forward or backwards,"
Note : Rien n'indique que Walter ait vu l'impact en lui-même à l’occasion d’un témoignage qu’il aurait pu donner avant d'être interrogé par Bryant Gumble sur CBS. Dans cet article de CNN, en date du 11 septembre, il n'est pas question d'impact ni d'ailes repliées. GUMBEL: Did you see it hit the Pentagon? Was the plane coming in horizontally or did it, in fact, go on its wing as--as it impacted the building? Mr. WALTER: You know, the--the--the--there were trees there that kind of obstructed it, so I kind of--I saw it go in. I'm not sure if it turned at an angle. I've heard some people say that's what it did. All I know is it--it created a huge explosion and massive fireball and--and you knew instantaneously that--that everybody on that plane was dead. It was completely eviscerated. " So Walter's claim to have seen the plane hit the building lasted all of 5 secs before he backed off the claim. Mr. WALTER: Well, as I said, you know, there were trees obstructing my view, so I saw it as it went--and then the--then the trees, and then I saw the--the fireball and the smoke. Some people have said that the plane actually sent on its side and in that way. But I can't tell you, Bryant. I just know that what I saw was this massive fireball, a huge explosion and--and a--the thick column of smoke and then an absolute bedlam on those roads as people were trying to get away." "Psychologically, this is pretty jarring. So often [reporters] show up, and the yellow tape is up and it's after the fact. To be there and watch it was very tough. What's really hard is my daughter goes to school with a lot of girls whose parents work at the Pentagon. One of her best friends...They didn't know what happened to her father. Now the parents are accounted for." Contexte : People, 24 septembre 2001. Souvenirs. I looked off, I was, you know I looked out my window. I saw this plane, a jet, American Airlines jet coming, and I thought this doesn't add up. It's really low. I mean, it was like a cruise missile with wings, went right there and slammed right into the Pentagon, a huge explosion, a great ball of fire. Smoke started billowing out and then it was just chaos on the highway as people either tried to move around the traffic and go down either forward or backwards. Contexte : CNN, le 7 mars 2002, témoignage montré en appui des cinq images de la camera de surveillance du Pentagone. Contexte : 21 mars 2002, Mike Walter est interrogé par LCI à l'occasion de la sortie polémique, la même année, du livre de Thierry Meyssan "L'effroyable imposture". J'ai regardé et j'ai vu le ventre argenté de l'avion. Et il a tourné et il a plongé. Et vous pouviez voir le sigle d'American Airlines sur le côté. Je ne sais pas si c'était un 737 ou un 747. Tout ce que je sais c'est que c'était un avion de ligne et je l'ai vu foncer vers le Pentagone. (...) C'est comme une canette de bière qu'on écrase contre un mur. C'est fait d'aluminium. Ce qui s'est passé c'est que les ailes se sont repliées et tout a été aspiré comme ça. C'est pour ça que le trou à l'air si petit. Il y a des gens qui disent que je mens, mais j'ai vu ce que j'ai vu. Les ailes se sont repliées et elles sont rentrées comme ça et il y a eu une énorme explosion. This is a subjective page. In an event of this magnitude the human factor is obviously significant. An eyewitness statement is just that, somebody's personal experience in statement form. It's human and it involves emotions. I did not "grill" Mike and technically analyze any of his comments. I am not neutral in that sense when it comes to this page. I want this to be very clear: I like Mike and becoming more acquainted with him makes me unscientific. If you can hear his testimony as it is intended then you may benefit from Mike's perspective. This is a stand-alone page. Mike's participation is not an endorsement on his part of any other aspect of this site. It is an opportunity to listen to somebody who was there and learn how it has affected their life since the event. QUESTION: Can you describe how you became aware of the aircraft? MIKE WALTER: I will never forget that day, trapped in traffic and then I rolled down the window and heard the sound of the jet overhead. I wasn’t surprised. I worked in the USA today building in Roslyn nearby and we were used to seeing a lot of choppers coming to the helipad at the Pentagon and a lot of commercial jets heading to Reagan which is nearby. But for some reason I looked up and saw the underbelly of the jet as it gracefully banked, then I watched in shock as the jet basically lined up the Pentagon in its sights and began to scream towards the mammoth structure. I watched as it continued to dip from the sky, diving towards the Pentagon. There are some trees that are adjacent to 27 the road I was stuck on, so the jet went out of sight momentarily. Then I picked it up as it struck very low into the Pentagon. The wings folded back and it was like watching someone slam an empty aluminum can into a wall. The jet folded up like an accordion. There was a huge fireball. There was the initial shock of what had just happened. All of the drivers seemed to be in a trance. Then suddenly it ended when a woman began to scream, “They just hit the Pentagon, get back, get back.” She backed her SUV back and forth until she was able to create a crease and then she sped out of the area on the emergency lane. That’s when all hell broke loose as people began trying to get out of the area any way they could, some went forward, and others turned their cars around and drove in the wrong direction. All in an effort to get out of the area. QUESTION: How did you end up getting interviewed? MIKE WALTER: I had a choice to make. Did I want to get out of the area and drive into work? That would mean continuing on 27, and then turning into the Pentagon North Parking lot exit. That exit allowed me to swing around and get onto 110 which took me right to work. On a normal day I was merely 5 minutes away. Or I could pull over and park and wait for a photographer to arrive. This would obviously be the story I would cover on this day. I decided to pull over. As I got out of the car and made my way towards the Pentagon I saw pieces of wreckage on the ground. Your natural instinct is to reach down and pick up the pieces and look at them. But I decided against it, because I knew that the wreckage was evidence. So I continued on. I was driven to find a photographer for the station that we worked with here in the nation’s capital. I wanted to make sure that they knew I had witnessed the impact and could describe what happened. I finally found a photographer. He had me explain where I was on camera and describe what I had seen. He then directed me to an area where an anchor was beginning to go live. I had to scale a fence and walk quite a distance to get to him. I got to the top of the fence and as I was transitioning to the other side I lost my balance somewhat and managed to cut a huge gash in my right hand before I could finally grab a hold of the chain link fence and get my balance. I still carry that physical scar and the psychological scars of that day. Once I had found the anchor and explained what I had seen the word began to spread that I was a witness. There were lots of witnesses there that day but they had left the area after the attack. I was interviewed by a man from Bloomberg, then John McWethy of ABC news interviewed me, and then the floodgates opened. I was interviewed by people from a variety of print and television outlets. A young producer with CBS asked if I would be on with Bryant Gumbel on the early morning broadcast the next morning. I agreed to do it, and would also appear on the CBC as well the next morning. But it was later in the day after I had spoken with my daughter on the phone that I consented to an interview with Jamie McIntyre with CNN. My daughter had just told me that a number of her friends’ parents who worked at the Pentagon were missing. She was very upset, and I had no words to comfort her. Jamie asked a number of questions and I talked about that phone call and how tough the day was. QUESTION: As you know, a descriptive phrase you used was taken to mean an aircraft didn't strike the Pentagon. How has this affected you? MIKE WALTER: I don’t really remember the questions that were asked that day, I don’t really even remember what my answers were. The day became a blur really. But I do remember using a metaphor to describe what happened. I indicated to Jamie that the jet had become a weapon that day. I said it was like a cruise missile with wings. I never imagined for a moment that a statement like that would come back to haunt me over and over again. A French author would come out with a book describing in detail the conspiracy theory and he would use that quote out of context to help promote his conclusions. I was very angry about all of this, and I remain angry about it today. I’m also upset that so many people lost their lives that day and while some people who have written about that tragic day have donated any and all proceeds to the victims of 9-11, he has capitalized on it to make an awful lot of money. His book went on to be a best seller in France. My suggestion, buy “Covering Catastrophe” instead. It was written by the reporters who were there in Arlington, and in New York, and in Pennsylvania. The conclusion in the French book is absurd. I saw the jet; there is no doubt in my mind it was a jet that slammed into the Pentagon. As a result of his book I’ve been interviewed by both print and television reporters from France, and England. Recently on the anniversary of that terrible day I was once again interviewed for a documentary in Japan on this same issue. QUESTION: What was your impression of the aircraft and its maneuver? MIKE WALTER: I don’t know very much about aviation. There’s an irony to this since my father worked at Lockheed. I have a vivid memory as a child of going to an air show with my father and him describing to me the various makes of the jets. But to me for whatever reason I just have never spent a lot of time trying to discern the differences. I knew it was a big commercial airline. I saw the AA on the side so I knew it was an American Airlines passenger jet. I was surprised at how graceful and slow the banking of the jet appeared to be, and how quickly it accelerated after it had lined up the Pentagon. QUESTION: When the aircraft flew in front of you, how far away was it at its closet point? MIKE WALTER: I was stuck in traffic, but by my estimation it seemed as though it was about 8 or 9 car lengths in front of me. It was in the air coming down at a high rate of speed and a steep decline. QUESTION: Did you see the aircraft from nose to tail? QUESTION: What do you remember most about it? MIKE WALTER: I just remember thinking that I have to remember all of this; I have to take it all in. I just remember most that it struck very low into the Pentagon. I also will never forget seeing that AA insignia. I was asked by the FBI agent if I could make out any of the people on board the plane. But that would be an impossibility. It went by so quick, but I am still haunted by what I saw, and the thoughts of what it must be like to be on that plane heading toward sudden death. I have to be honest I suffered from a lot of nightmares in the days and weeks that followed. In one nightmare my boss would give me a mop and I would go up on the roof and start to clean it and then a jet would come slamming into the roof. In another nightmare I would be on the plane, and all of the people would be faceless. There was every variety of nightmare that you could imagine. And if I was alone in a car traveling and stuck in traffic I would replay it in my mind over and over again. I’ll never forget one incident when a big 18 wheeler was passing and one of its tires blew out, and I remember jumping. It was a tough period. QUESTION: Do you recall any turbulence or wind force associated with its passing? MIKE WALTER: I don’t recall any turbulence or wind force. QUESTION: Did you see it hit anything prior to approaching the Pentagon? MIKE WALTER: There were periods where it seemed like the pilot was trying to stabilize it, I believe that may have been when it hit one of the light poles. But I don’t remember it hitting anything early on, although I am sure it must have hit one of the light poles right around the area where I was. Like I said to you yesterday you tend to second guess yourself because so many people have said so many different things. I do feel like it struck something near the point of impact, because I kind of remember sparks or something and the jet kind of wobbling or whatever right before impact. QUESTION: How far away would you estimate that you were from seeing the aircraft hit the building? MIKE WALTER: I’m not good with distances. I was quite some distance away. QUESTION: Can you describe what you recall of the actual impact? QUESTION: After you parked your car and approached the Pentagon on foot what was your impression of the debris? MIKE WALTER: I didn’t see a significant amount of debris. I just remember two things about this. One was the piece of wreckage I described earlier and the instinct to pick it up. Then I remember at some point later in the morning seeing a guy holding a piece of wreckage next to his head with the Pentagon in the background smiling and having his picture taken. I can’t describe for you the rage I felt. I unleashed on the guy and told him that he had no business doing what he was doing and that this was evidence and he should have just left it where he found it. He then said oh well there’s a guy collecting the stuff right now, so he just walked it over to this guy. I felt like the collection of the evidence was pretty disorganized. But it was a very fluid situation, and no one really knew what was going to happen next. After all there were two attacks in New York, so naturally people were jittery and concerned about another possible strike here. There was just an awful lot of chaos. QUESTION: Were you ever asked any questions by officials at the scene? 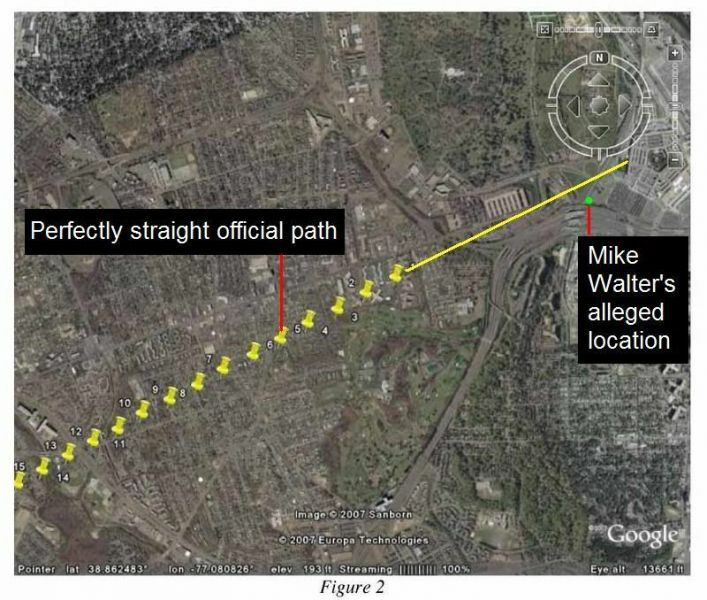 MIKE WALTER: I spoke to a military PIO [Public Information Officer]. He told me that the FBI wanted to talk to me. I gave him my card with my number on it. This is when I began crying about what I had seen. I was pretty embarrassed by this. I’ve witnessed a lot of bad things in my career. Shootings, fatal fires, earthquakes, tornadoes, and I’ve also been in a war zone. So I was really surprised at this response. He hugged me, and told me that it was okay and that I was in a state of shock. If I remember correctly the agent called me later that day and left a message. I called her back and talked to her briefly. The next morning two agents interviewed me at work. QUESTION: Have you ever been approached by people with theories that contradict what you saw? MIKE WALTER: I’ve only been interviewed by people about this as I described earlier. In fact it seems like I do more interviews about the conspiracy now then I do the attack. It’s strange. This interview with Mike was in an email format on 1/17/05. The phone calls did not cover anything critical that isn't in the interview. I ask that any quotes from this interview please be used in context and with the knowledge that it was subjective on my part and not intended as a fact-finding statement. Oui, plusieurs sources, voir plus haut. 2. L'identité du témoin est-elle connue et démontrée ? Mike Walter a été en premier lieu interrogé le jour même de l'attaque. Ses premières déclarations ont été recueillies par un journaliste de CBS une bonne heure après l'attaque. Vers 10h, le 11 Septembre, CNN a rédigé un article où sont retranscrits plusieurs témoignages dont celui de M. Walter. Mike Walter a ensuite donné un autre témoignage le 12 septembre 2001, encore sur CBS, au cours d'une interview réalisée en live par Bryant Gumble. Le 21 mars 2002, Mike Walter est interrogé par LCI à l'occasion de la sortie polémique, la même année, du livre de Thierry Meyssan "L'effroyable imposture". En 2009, il sera interviewé dans le cadre de l'émission remarquablement objective de Stephan Malterre. Plusieurs témoignages, voir plus haut. Mike Walter se rendait en voiture sur son lieu de travail. Au moment où l'avion est apparu dans le ciel, il se trouvait sur la Route 27 qui longe la façade ouest du Pentagone. Walter a identifié un avion de la compagnie American Airlines. 12. Donne-t-il des indications relatives à la présence d'un second aéronef ? Oui, il affirme avoir entendu l'avion après avoir ouvert sa fenêtre. Il explique n'avoir pas été surpris par le bruit de l'apapreil car il est habitué aux bruit des hélicoptères et avions. De part ses gestes, Mike Walter montre à chaque fois une approche nord de l'aéronef. D'une part il affirme que des arbres lui bouchaient la vue mais il expliquera plus tard avoir vu l'avion s'écraser comme un accordéon, et même que ses ailes se seraient repliées. Il explique que cela ressemblait à quelqu'un lançant une boite en aluminium contre un mur. Oui, Walter expliquera plus tard tard que les ailes se sont repliées, que l'avion s'est écrasé comme un accordéon et que cela ressemblait à quelqu'un lançant une boite en aluminium contre un mur. Mike Walter n'a fait qu'une seule fois référence à la chute d'un lampadaire. Ce fut lors de son tout premier témoignage sur CBS, dans lequel il affirme que l'avion a bien percuté le premier lampadaire. Cependant, il ne parle pas des quatre autres lampadaires et avoue ne pas avoir vu le taxi de Lloyd England sur lequel est censé être tombé le premier lampadaire dont il affirme pourtant avoir été témoin de la chute. Mike Walter est journaliste à USA Today, une chaine mainstream appartenant au groupe Gannett. Douglas H. McCorkindale fut PDG de cette dernière société de 2001 à 2006. Cette double casquette suffit-elle à caractériser un conflit d'intérêt? A t'elle eu une influence sur la façon dont les journalistes de USA Today ont traité les attentats du 11 septembre 2001 ? Il existe au moins une incompatibilité entre les différentes déclarations de Mike Walter au sujet de l'impact du vol AA77 sur la façade du Pentagone. Dans son interview sur CBS, le 12 septembre 2001, il affirme ne pas avoir vu l'impact lui-même à cause d'un bouquet d'arbre qui aurait obstrué sa vue au dernier moment. Cependant, il affirmera le contraire dans son interview du 21 mars 2002. Sa nouvelle description des évènements fait maintenant état d'un avion qui se serait ratatiné sur la façade du Pentagone comme un accordéon. Qui plus est, le 17 janvier 2005, à l'occasion d'une correspondance élèctronique entre Russell Pickering, le créateur du site Pentagonresearch.com, et Mike Walter, ce dernier affirmera que les ailes de l'avion "se sont repliées" lors de l'impact. Le témoignage présente donc des ajouts tardifs et "exotiques" tels que le repliage des ailes en regard de la petitese du trou d'impact. Ceci semble avoir été influencé par la polémique en cours à ce moment-là. Walter affirmera tardivement que les ailes de l'avion "se sont repliées" lors de l'impact. Ce témoignage constitue un ajout tardif et "exotique" en regard de la petitese du trou d'impact. Ceci semble avoir été influencé par la polémique en cours à ce moment-là. Oui, dans son échange avec Pickering, Walter soutient qu'il a vu que le pilote essayait de stabiliser l'appareil. Ce qui ne semble pas être perceptible à 850 km/h. De plus, son explication des "ailes qui se replient" ne semble n'être là que dans l'objectif d'appuyer la théorie non-officielle selon laquelle si le trou d'entrée est si petit c'est parce que les ailes de l'avion se seraient repliées vers la carlingue. En outre, il affirme n'avoir pas été surpris par le bruit de l'avion lorsqu'il a ouvert sa fenêtre, car il se dit habitué à entendre des hélicoptères et des avions passer. C'est la vue de l'avion qui l'a surpris. Tout ceci est extrêmement contestable. Tout d'abord le commentaire en rapport avec la vitesse de 850 km/h provenant du rapport officiel et nullement établie par personne et encore moins par le témoignage de Mike Walter. Ensuite le fait qu'il décrive des mouvements violents de correction en trajectoire finale juste avant impact n'a aucun caractère de bizarrerie, bien au contraire. C'est même cohérent avec le témoignage de Lagasse. Le fait qu'il dise avoir vu les ailes se replier peut être à l'évidence pointé comme une description non-conventionnelle, mais rien ne permet de dire que c'est techniquement impossible, ou que ce soit là pour appuyer une théorie pro-VO. C'est totalement subjectif et typique des militants "no-plane", donc pas objectif du tout. Enfin, la dernière phrase sur la perception du bruit est censée examiner des aspects d'invraisemblance ou d'indice objectif de fabrication, mais elle est totalement hors sujet ici. Le bruit de l'avion peut être perçu à divers niveaux suivant l'emplacement, et un bruit d'avion dans ce coin c'est assez banal. Cette dernière question ne devrait absolument pas faire partie des fiches, elle doit être posée dans un débat. Non, ça commence à bien faire avec cette histoire de dogme. Et si cette dernière question doit bien faire partie de l'analyse. Pour la vitesse de 850 km/h pourquoi dire que Walter a raison et que la boite noire a faux ? L'un des deux a nécessairement faux, et cela que l'on en retient. Ton commentaire sera pris en compte MMF, comme ceux des autres. Mais ce n'est pas parce que tu penses qu'aucun des témoins a menti qu'ils ne faut pas examiner si leur témoignage présente des invraisemblances. Mon commentaire au sujet du bruit me paraissait objectivement pertinent mais effectivement il ne l'est peut-être pas. Ne doit-on pas les prendre en compte ? En tous les cas merci pour ton commentaire, je vais essayer de reformuler la réponse à la 23 jusqu'à ce qu'à ce que tout le monde soit d'accord. Je ne défend pas un dogme, tout est tellement complexe et invraisemblable dans l'affaire du 9/11 que défendre un dogme relèverait dans la plus grande bêtise. La vitesse de 850 km/h est un élément plus que suspect, comme tout le rapport NTSB, et la prendre comme une référence de base pour jauger les témoignages d'avion constitue une faute de méthodologie qui ruinera toutes les analyses de passage d'un avion. La constance d'emploi de cette référence absurde et suspecte, assénée comme un dogme (il n'y a pas d'autre mot, désolé! ), amène à se poser des questions sur l'impartialité de l'analyse. 1-Qu'il n'y a pas eu d'impact d'avion de ligne, on en a les preuves. 2-Que si un avion de ligne est passé, il est passé à 850 km/h, c'est officiel. 3-Que en conséquence et de façon automatique, les détails décrits par les témoins en terme de passage et d'impact sont évidemment inventés et/ou mensongers. Je te cite: "23. Le témoignage présente-t-il des indices objectifs de fabrication ou d'invraisemblance?Oui, dans son échange avec Pickering, Walter soutient qu'il a vu que le pilote essayait de stabiliser l'appareil. Ce qui ne semble pas être perceptible à 850 km/h. " D'abord, Mike Walter, qui est journaliste et pas pilote, n'a pas évalué la vitesse avec précision. Aucun chiffre n'est donné dans ce témoignage, alors pourquoi cette utilisation de la vitesse de 850 km/h pour juger ce témoignage? Les témoignages de manoeuvres brutales de stabilisation en finale (voir Lagasse) sont cohérents avec un avion arrivant à vitesse rapide (le maxi d'un 757 à 20m de haut est 600-650 km/h) contre les lampadaires et soumis à un effet de sol relativement important. Une sortie de virage très rapide peut également contribuer à déstabiliser l'appareil. Il me semble en effet que l'expression de "pivot" employée par Walter décrit un mouvement de rotation rapide qui en termes de physique du vol s'applique plutôt au roulis qu'au tangage ou au lacet, pour lesquels un avion présente beaucoup plus d'inertie. Plusieurs autres témoins ont remarqué une rapide mise à plat au passage de la R27. Maintenant, si on aborde l'analyse avec l'idée que ce type d'évènement ne peut pas s'être produit pour plein de raisons plus politiques et polémiques que techniques, cet effort d'analyse sera biaisé d'emblée comme l'est ta conclusion sur le témoignage de Walter. 1-Description précise de l'approche d'un avion de ligne AA en virage (à gauche car il voit son ventre) à forte vitesse et en descente, puis stabilisation à plat (pivot) avec trajectoire finale rectiligne toujours en descente. 2-Le virage était lisse et régulier, et l'avion a effectué de brutales corrections en finale. Cela peut corroborer un guidage automatique en courbe et des perturbations en sortie de virage et en ligne droite finale, tels que chocs et effet de sol. 3-L'altitude en diminution constante jusqu'à être masqué par les arbres plaide plus pour un impact que pour un survol. De l'endroit où était Walter, on ne pouvait pas confondre un avion en ressource et un avion en descente. Un survol au ras des toits par un tel avion à ces vitesses et à partir de 30m du sol (Lagasse) au niveau Citgo exige de commencer la ressource avant la R27. Cette description est très différente des deux trajectoires de la VO, toutes deux rectilignes, et contrairement à celles-ci, elle semble possible techniquement (de 550km/h à 640km/h maxi), et capable d'aboutir à un impact. C'est un point fondamental et généralement passé sous silence, de façon pas vraiment innocente, par tous les truthers "anti-crash-Boeing". 1-La description de l'impact par le témoin est sujette a caution: Il a présenté plusieurs versions de cet impact et tout donne à penser qu'il a fortement enjolivé sa vision, ce qui peut s'expliquer par un besoin d'être complet même en inventant, ou une réinterprétation de souvenirs pas assez précis. Il semble qu'il ait eu une vision fortement masquée de ce qui semble quand même avoir été un impact au vu du témoignage en général. 2-Il a fait une métaphore regrettable en comparant l'avion à un missile de croisière, qui a donné lieu à d'inutiles et improductives polémiques, il y avait sans doute une meilleure façon de traduire l'impression que lui a donné l'avion. 3-Le témoignage présente des ajouts tardifs et "exotiques" tels que le repliage des ailes en regard de la petitese du trou d'impact. Ils semblent avoir été influencés par la polémique en cours à ce moment-là. Cependant il n'est pas le seul à déclarer avoir vu cela. Il faut d'abord se poser la question si cet évènement est possible techniquement avant de déclarer le témoin halluciné, mythomane ou mensonger. Conclusion personnelle: Témoin sincère globalement, mais pas sûr 100%, il existe des éléments non fiables pour évaluer les conditions d'impact notamment. Voilà ce que j'aurais dit. Mais ce n'est pas le style de la maison, je le vois bien. Alors je ne crois pas que je vais intervenir sur ce fil, malgré ton invitation. Indépendamment des accusations gratuites de dogmes proférées par MMF (une vieille rengaine), il serait intéressant dans le cas particulier des témoins, comme Walter, qui donnent plusieurs récits, de commencer à remplir une grille par témoignage donné. Cela facilitera l'objectivation des réponses aux questions 22 et 23, grâce à la comparaison des réponses pour chaque grille. Monsieur, votre citation di Kikijitoh est tronquée. Je vous suggère serieusement de lire un peu plus ce qui se passe ici avant de sauter aux conclusion sur l'état d'esprit et le niveau d'information des gens que vous voyez poster. CECI ETANT : il est très clair qu'il y a de grosses incohérences entre les témoignages. Bien que j'admire la patience de l'effort d'épluchage j'ai du mal à espérer grand chose d'un tel effort, mis à part peut être définir une tendance forte sur trajectoire nord vs trajectoire VO. Qu'en est-il de cette interview ?